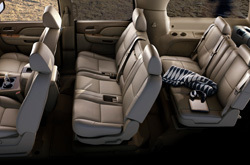 Welcome to the Reliable Chevrolet review of the 2013 Suburban. All Chevrolet franchises in Springfield are not alike. We feel it's our job to outfit customers with quality Chevrolet reviews that set us apart from the typical franchise. The following article is packed with essential material- it contains everything so that you can make informed decisions about the Chevrolet you want to buy. Get started by watching the video below or move on to the full review. When comparing the 2013 Chevrolet Suburban alongside the 2013 Toyota Sequoia, Dodge Durango, Nissan Armada, Ford Expedition EL and the Buick Enclave, and you'll catch that the Suburban outshines those autos in many aspects. View just a few of the reasons below. You won't get Chevrolet trained service techs, a complimentary warranty on service and legitimate Chevrolet parts at a megacorp auto facility in Springfield, so visit Reliable Chevrolet instead. 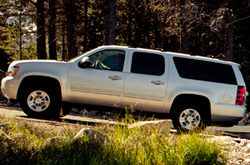 Your Suburban will run fitly with work from the professionals at our Springfield service center. Whether you need us to call the shots on a easy job as an oil change, or take on intricate Chevrolet service and repairs like transmission rebuilds, strut and shock repairs, timing belt replacements. Reliable Chevrolet is your clear winner in Springfield for certified, professional Chevrolet Suburban repairs and scheduled maintenance. Check out our service specials by clicking on the link below.